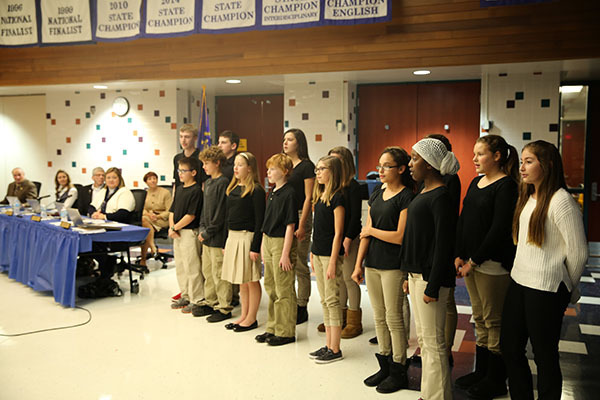 Schmucker Middle School students and programs were the stars of the show at last night’s Board meeting (Monday, Nov. 28, 2016). Every year, the Board chooses three to four schools to hold their Board meetings. The school meeting sites are a way for Board members to not only visit the schools, but to give the schools a chance to highlight their successes. 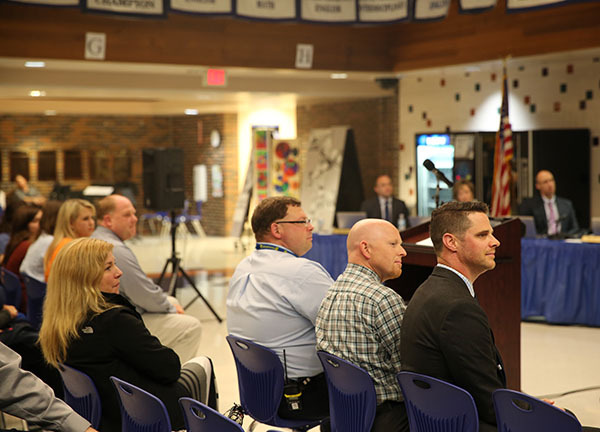 Schmucker Principal Sean Galiher used the opportunity to demonstrate the school’s motto of setting the bar for students by Building Community, Empowering Learners and Inspiring Creativity. All of the programs highlighted, student displays and performances last night were examples of Schmucker’s motto put into action. Principal Galiher introduced a video that explained the school’s Advisory program. When the bar is set high for students, they become empowered learners who keep striving for success. Schmucker’s STEM initiatives and Project Lead the Way have opened up a lot of learning opportunities for students. PLTW teacher Matt Reininga discussed the PLTW class rotation that all sixth grade students take. Seventh and eighth graders have can chose the class as an elective rotation--with seventh graders focusing on 3D design /printing and eighth graders narrowing in on computer science problem solving skills designing apps. Mr. Reininga also told the Board about the middle school’s Vex Robotics Competition Team successes. In year two of the program, Schmucker now has three teams. 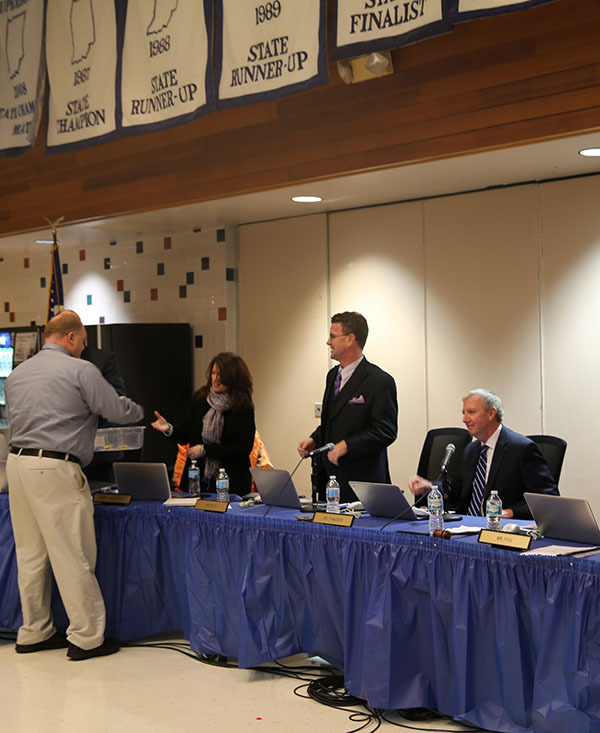 At the end of Mr. Reininga’s presentation, he and Principal Galiher presented the Board with P-H-M ‘Triangle of Success’ magnets that the students designed and printed out on the school’s 3D printers. Jennifer Husband, eighth grade science teacher, also got the chance to explain her STEM co-curricular STEM initiatives. Last year Ms. Husband started a TEAMS group. TEAMS stands for … Testing Engineering Aptitude, Mathematics, and Science. As Ms. Husband described for the Board, TEAMS allows students to increase their knowledge about what engineers do and how they can help make a difference in the world. Last year’s Schmucker TEAMS’ students placed 2nd in the Nation by researching and writing a paper on the application of Synthetic Neurobiology … a topic they knew nothing about. For the build challenge, without prior knowledge or prep time, they had to build a device that would reflect as much light as possible into the iPhone directly below the light source. 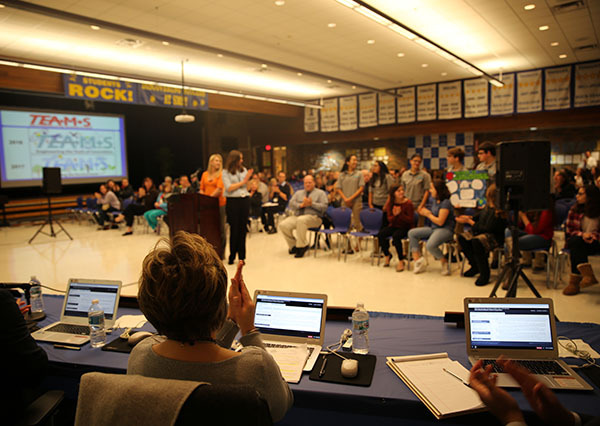 Again these Schmucker STEM Spartan stars placed second overall in the country … achievements that earned them a round of applause from the Board and audience. There’s no doubt that Schmucker inspires creativity in students and teachers. 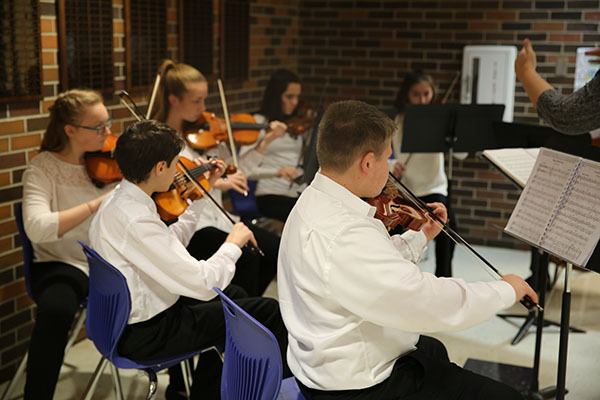 The Board was treated to performances by the string quartet led by Mrs. Dorothy Carnall, the eighth grade band led by Mr. Jeff Carnall and the Circle the State choir led by Mrs. Donna Hipsher and Allison Secur. 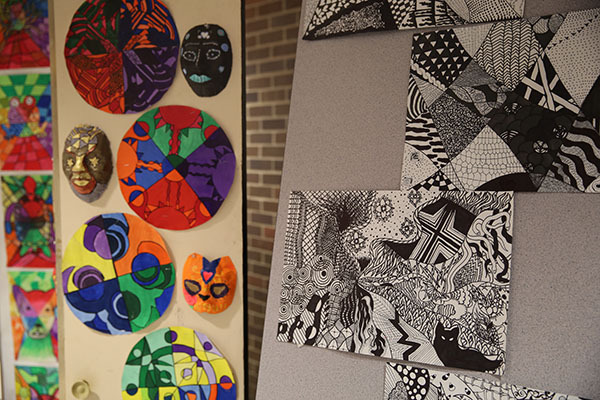 Art displays and other work done by the students of Art Teacher Mrs. Tomi Perkins and Language Arts Teachers Ms. Kristina Turpin and Mrs. Renee Johanson.